Pick-Up Orders have a $200 minimum, Delivery & Setup Orders have a 20 person minimum and Full Service events require a 50 person minimum. For Pick-Up, Delivery or Set-up orders we require 48 hours minimum notice. For full service events we require 2 weeks notice, but of course more notice is always appreciated! We’ll do our best to accommodate orders with less notice but we cannot guarantee anything. That’s the nature of of really good BBQ, slow and low takes time. We serve 11am-9pm every day of the week (Sunday - last call is 8pm) please inquire for full service event times. Saturday & Sunday: 9-11am. Weekends are a popular time for events please expect a less timely response as we’re often busy serving other guests delicious BBQ. To get more information about catering, please click on the “request an order” link to send us details about your event, the more details you can give us the better. Helpful information includes the date and time of your event, headcount, location and the type of service you’re interested in (see catering menu for our list of service options). We’ll get back to you with a quote as soon as we can. Please see office hours for the fastest response times. Delivery rates vary based on location from the restaurant. Sign up to hear about the latest news and events at Bludso's. Having a Birthday Party or Special Event? The legend of Bludso's BBQ begins in Corsicana, Texas, where the Bludso family has been perfecting the craft of slow-smoked meats for five generations. But while his family roots are laid in Texas, Kevin Bludso was born and raised in Compton, California. 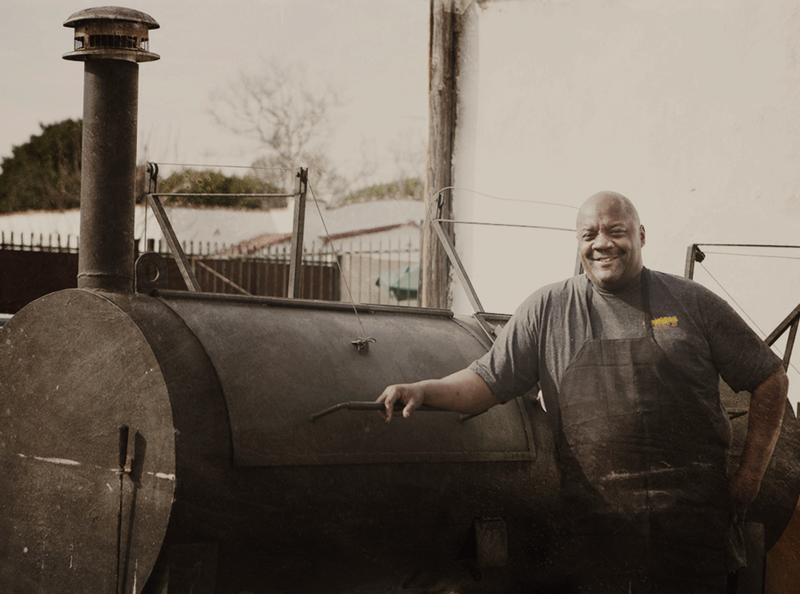 To stay out of trouble, Kevin spent his childhood summers in Corsicana, working long, grueling hours on the pits for his granny, Willie Mae Fields. There, he honed his craft while swearing up and down that he was never going into the restaurant business. He even spent 15 years with the L.A. Department of Corrections, trying to hide from his true calling. But finally, the allure of smoke, meat and family heritage was just too much to resist. So in 2008, Kevin opened Bludso's BBQ, right in the heart of Compton. It was quickly regarded as the best BBQ in all of Los Angeles. Now, with a beloved sit down bar and restaurant on La Brea Boulevard and even an outpost in Melbourne, Australia, the Bludso's legend continues to grow. © 2016 Bludso's Bar & Que. All rights reserved.